We spent over 27 hours researching and testing 10 different aquarium kits and found that the type of products in the kit, cost, and aquarium size were most important. Back to the Roots Water Garden scored high marks in all categories and is our top pick. This unique beta tank kit features a grow bed that is on top of the aquarium. Plant pods are grown on top and are fertilized by the waste from the fish. As the plants grow, they clean the water which eliminated us from having to clean the tank. The small 3 gallon tank is the perfect size for beta and other small fish. These top rated aquarium kits have everything you need to get started with the fish of your own. None of the tanks are overly big or complicated to set up which makes them perfect for those just starting out with fish. You can always purchase additional aquarium decorations with any of these kits, but they all come with standard supplies that you need for initial set up. Fish tanks add serenity and a soothing atmosphere to any room you put them in. Children love to watch the fish swim and since feeding and care is usually fairly simple for fresh water aquariums, it is a good way to teach them how to care for a pet. We’ll review these three top rated aquarium kits and tell you about their features, what they include and give you other information about them so you can decide if one of these kits is what you are looking for. Not only do you get to enjoy watching your fish in this 3 gallon tank, you get to grow things too. This is the perfect Betta tank with a unique twist. It creates a closed loop ecosystem wherever you choose to put the tank. It is self cleaning, sustainable and doesn’t take up a lot of space either. The process is very simple; there is a convenient grow bed that sits on top of the aquarium that has plant pods in it. A pump takes the waste that the fish create and draws it up into the plant pods to fertilize the plants. As the plants grow and flourish with the fertilized water, they also clean the water at the same time which prevents the tank from having to be cleaned. You don’t have to be great with plants to make this work; they really grow and take care of themselves. All you need to do is keep the Betta fed and keeps the tank topped off with the water it requires and everything will work beautifully. This is the perfect gift for a child that loves fish or for the plant and animal lover in your family. You can grow organic produce or even an herb garden with this great system. Place the tank on your desk or kitchen counter or even on your dresser. 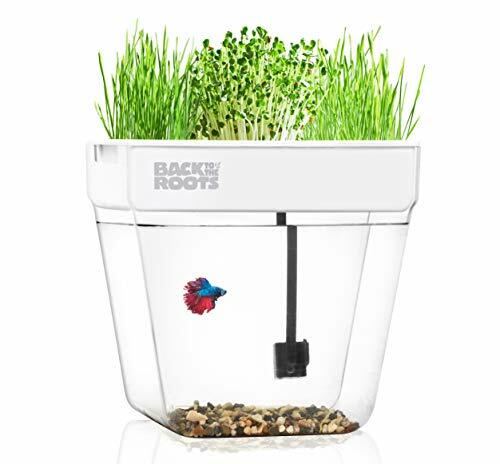 You have everything you need included in this aquarium kit: 3 gallon tank, grow bed with grow lid, fish food, organic seeds, and even a discount coupon for a Betta fish. 10 gallon aquariums can add a level of serenity and beauty to any room in your home. This aquarium kit makes getting set up easy by including everything you need. You will get a Marina Slims15 clip on filter with quick change cartridges, Nutrafin fish food, Nutrafin AquaPlus and Nutrafin Cycle to keep your tank beautifully clear, a net, thermometer, care guide and an incandescent canopy and bottom frame with two clear bulbs. All you need to do is follow the set up instructions and get some fish. You also want to get some gravel and plants for your tank too! (Sold separately) The tank measures 20” wide x 10” long x 12” tall. It’s easy to maintain and cleaning is not needed thanks to the filter system that is included. If you or someone you know loves fish, this is a perfect gift to get them to get started. They can set it up to be fresh water or salt water (salt water DOES require quite a bit of maintenance) and is big enough to hold several fish. This tank can be set up in any room and can be placed on a dresser or table or you can buy a specific stand for it. It’s fun to add different novelty type tank decorations and there are tons available that you can choose to exhibit your own personal style. If you want something with a bit more flair, you will love the look of the Marineland Contour Glass Aquarium Kit with Rail Light. The tank holds 3 gallons which gives you plenty of room for several small fish. The curved glass and LED lighting system provide quite a serene show that you will really enjoy. The lighting system is made up of bright white and blue LEDS that look great whether it’s daytime or at night. You won’t have to worry about cleaning the tank thanks to the advanced filtration system and pump that are also included. This 3 stage filtration system keeps the aquarium crystal clear and healthy for your fish. The filtration system is not visible due to the sleek design of the tank. A hinged light allows you to access the tank easily if needed. The easy to use glass canopy slides over the filter and provides a space for feeding your fish and adding water if necessary. It is also beneficial for preventing the fish from jumping and helps to maintain the water temperature as well. 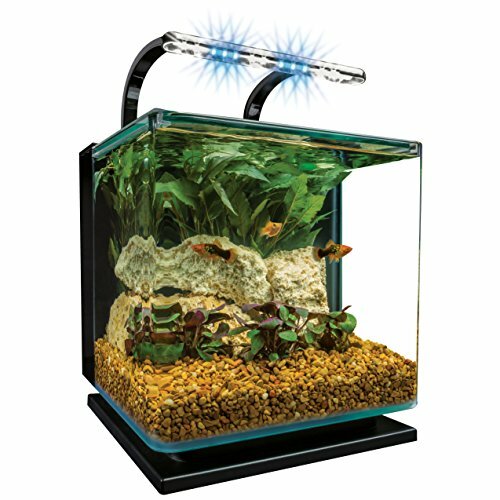 It is a very stylish aquarium kit that adds a lot to your home’s décor, especially when the blue LED moonlight lights are on. All you need to do is pick out your fish, get some gravel and plants or other tank decorations and you’ll have a fish tank that your family and friends will rave about and possibly even want to get for themselves. Aquariums are very enjoyable to have around and most people love to just sit and watch the fish swimming around. There is a peacefulness that they offer that many find to be extremely calming, especially after a hard day. These top rated aquarium kits are all inclusive and have everything you need to get started except for the fish and gravel. You will love how easy it is to set any one of these kits up in your home. They make perfect gifts for anyone who loves fish and even if they’ve never had fish before, you may introduce them to a whole new world. We have included a buyer’s guide that will provide even more information about choosing an aquarium kit and what you want to look for. This buyer’s guide will make sorting through all of the choices much less challenging. You’ll be able to choose the one that will meet your needs and preferences with ease. What is an Aquarium Kit? An aquarium kit is a complete package that has everything you need to set up an aquarium. Depending on the brand or manufacturer, an aquarium kit can contain the tank, filter, filter cartridges, net, gravel and more. Some even have gravel and fish food included. Buying an aquarium kit is typically less expensive than buying everything individually. Aquarium kits can come in all shapes and sizes, from a small 1-3 gallon to a large 50+ gallon. There are so many different choices on the market for the buyer to choose from that it may become frustrating or overwhelming if you are new to the world of having aquariums. Aquarium kits can be comprised of different shapes, sizes, materials, contents, and even type of fish that can go into it. You need to know the differences before you start shopping and also have an idea of what you are looking for. These things will ensure a much easier and enjoyable time finding your perfect aquarium kit. There are several things you want to think about before you start the process of looking for an aquarium kit. Looking at the different kits will already save you some time and money since they will contain the things you need to get set up initially, but even with that part taken care of you still need to think about the following things. How Many Fish do You Want? – If you want a lot of fish, the tank you choose will need to be bigger. If you only want a couple you are free to choose any size, from a small 2 or 3 gallon to a larger one that can accommodate larger fish. How big do you want the tank to be? – This is an important question and will determine how many fish you can get. A 3 gallon tank will hold 4-5 smaller fish comfortably and more tiny fish. If you like larger fish you may only be able to house 1 in a tank so small. How many fish you want and how big of a tank you want go hand in hand as one determines the other. Freshwater or Saltwater? – Do you have a preference for salt water fish? A salt water tank requires much more maintenance but the variety of fish you can choose from is terrific, especially if you like the more colorful, unusual fish. Freshwater is much easier to maintain and doesn’t require daily monitoring to ensure the levels are correct. How Much Space do You Have for a Tank? – Where you want to put your tank will also determine the size you get. If you want a desktop style, those will be much smaller and fit nicely on a desk or table. If you have a larger space to fill you can get tanks from 10 gallon all the way up to more than 50 gallon. Space, your fish budget and how much time you want to spend on the tank all play a part in hoe big of a tank you choose. If you’re just getting started owning fish, it is recommended that you start with a smaller tank and get used to taking care of that one before going for the large models. Aquarium Kits have aquariums that are made of either acrylic or glass. Which one you choose depends on the properties that are important to you. We have explained the differences between the two as well as the benefits and drawbacks of each material. Acrylic – Acrylic tanks are very lightweight and have smooth corners that won’t chip. Acrylic may feel like plastic but it is more durable than regular plastic. Acrylic tanks are easier to move because they are so light, so if you change your mind about where you have placed it, moving to another place is fairly easy. It has less distortion of the view into the tank than glass does but can be easily scratched if one is not careful. It can break if treated roughly or dropped, so care will still need to be taken during set up. You need to have a strong base of support underneath the tank to ensure the acrylic doesn’t bow. Glass – Glass tanks are much heavier than their acrylic counterparts, but they do not scratch easily and only need support along the edges of the tank. They can get chipped if care is not taken when working with and around them. Glass aquariums are cleaned much easier as well. There is a bit more distortion with a glass aquarium but it doesn’t detract from the beauty of them. You can still see through the glass just fine, there just may be a bit of a distorted view where things inside the tank look bigger. Keep in mind that the size of the surface of the tank determines how much oxygen gets to the fish. This oxygen is very important to the health of your fish. The longer aquariums provide a lot of surface space and also give the fish much more room to move around and swim naturally rather than just in a circle or small area. Whenever you decide to buy an aquarium kit, you will find that it has many of the things you need already. These items, in most cases, will be the basic things you need to set up an aquarium. If you want anything fancier or more upgraded in terms of filters, etc. You will need to buy those separately. Aquarium kits are generally best suited for those just starting out with fish or children and not for experienced fish owners. There are several things you need to have when purchasing an aquarium kit. Make sure that the kit has these elements or add them separately if needed. All of these components are important for a well running tank that keeps the fish healthy and happy. Filter System– A filter is extremely important to the cleanliness of the tank and the health of your fish. There are three basic types of filters that you can get for an aquarium: Under gravel filtration, power filter and canister filter. More than likely, your kit will come with a basic filter and cartridges for that filter. If you want something stronger or different, be sure to check into the different filters available and get a good one. The filter you choose will depend a lot on how much maintenance you want to provide for the tank. If you want one that doesn’t require a lot of work or attention then you want a power filter as a first choice and the canister as a second choice. Under gravel filters require the most maintenance to keep them running smoothly. Heater – The size of the aquarium and the temperature difference between the tank and the room it is in will determine the size heater you need. A larger heater is required for aquariums that are kept in cooler rooms. A larger heater is also required if a larger tank is purchased. A small heater is not going to work for a big tank. Heaters can either be hung inside the tank and are called submersible heaters. These are pretty inexpensive and make it easy to keep the temperature of the water more consistent. Substrate heaters are installed under the substrate or bottom covering of the aquarium. If you want to grow live plants in your tank, this is the heater for you. The last type of heater is the filter heater and it is installed inside the filter. It works by heating the water as it is filtered through. Decorations and Gravel – Decorations are more than just for looks. They provide the fish with hiding and resting places from people and even other fish. Rocks are also a good aquarium addition but should not be common outdoor rocks. Make sure to purchase them from a pet store or place that sells fish supplies. Live plants require more care but are great additions to any tank and provide a lot of benefits to the fish as well. Gravel is also good for the tank and provides a lot of visual appeal. Fish tank gravel comes in a huge variety of colors, sizes and styles. You can color coordinate or do a bunch of different colors, whatever appeals to you the most. With all of the shapes and styles of aquariums around that can be purchased in aquarium kits, you have a lot to choose from. Buying an aquarium can be an investment of time as well as money so it’s important to make sure you’ve gotten exactly what you want. The information we have provided for you in this buyer’s guide can help you sort through the choices much easier and figure out which ones you prefer and which aquarium kits work the best for your personal needs and preferences. Whether it’s for yourself or a present for someone else, getting an aquarium is a lot of fun and can be really enjoyable to watch and take care of.